Ever since I had my first apartment, spaghetti has been a go-to dinner when money is tight or I just need something quick. Time and money usually determined if I just opened a jar of sauce or if I added ground beef and veggies. A couple of weeks ago, I saw a post going around on Facebook about an amazing no-drain-just-stir pasta dinner and I knew I had to give it a try! I was skeptical, but figured the ingredients weren't very costly should it not turn out and there was a fridge full of leftovers to fall back on if needed. Told you I was skeptical! But there was no need to pull out all the tupperware for leftover buffet! The recipe turned out great! The first time, I followed the original recipe as close as possible. Instead of just 12 oz. of spaghetti, I used a full 1 pound box. I also replaced the vegetable broth with chicken broth since it's what I had on hand, although I love the idea of making this completely meat-free by using some homemade veggie broth. 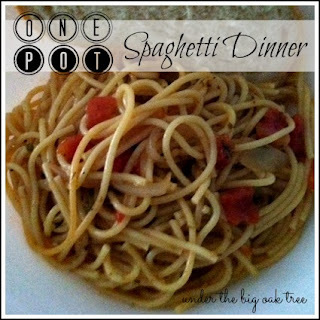 Break spaghetti in half and place in a large pot. Add in the onions, bell pepper, garlic and spinach. Pour broth and water into the pot, then sprinkle in the herbs/spices. Cover pot and bring to a boil over medium heat, stirring now and then. Once it comes to a boil, reduce heat and let simmer while covered until pasta and vegetables are tender, about 10 minutes. Stirring often. Garnish with parmesan cheese or additional red pepper flakes and serve with a chunk of crusty bread! Oh, man! It was so good! I sure wish I knew about this when I was working! Too many nights of working crazy hours and coming home to dishes still in the sink from the night before. This no-drain pasta could have saved us lots of money from all the take-out we ordered just to help get caught up on dishes! Besides the one-pot simplicity of this meal, I love how versatile it can be. Talking to friends that have tried this and also tossing some ideas around with Joe, we've come up with so many different ideas on what can be thrown into the pot! I cannot wait to give them all a try! Do you have the original recipe?